The Portrait of Doctor Gachet is one of Van Gogh's most famous paintings. It's notable for a number of reasons. It was painted in the last few months of Vincent's life and the subject has been the focus of a great deal of controversy. How competent was Doctor Gachet? What did Vincent mean when he wrote to Theo "First of all, he is sicker than I am, I think, or shall we say just as much" (Letter 648)? This portrait is also one of Van Gogh's most well known since it holds the distinction as the most expensive painting ever sold at auction. On 15 May 1990 The Portrait of Doctor Gachet was sold within three minutes for $82.5 million (U.S.) to Ryoei Saito, Japan's second-largest paper manufacturer. This record remains unbeaten, but an ironic footnote to this sale is the recent news that Christie's has purchased the work back from Mr. Saito for one-eighth the price he paid for it. This marks a dramatic change in the vitality of the Japanese art-buying community from its zenith in the 1980's. In fact, Vincent did two portraits of Gachet: this and a companion piece (F 754). In his original catalogue raisonné, Jacob Baart de la Faille considered the work above to be the superior of the two, but the editors of the 1970 catalogue disagreed and maintained that both works were the product of comparable skill. Whatever the opinion, it's clear that this particular Gachet portrait has had the far more colourful history. Note the plant on the table in front of Gachet. This is foxglove, from which the drug digitalis is derived. 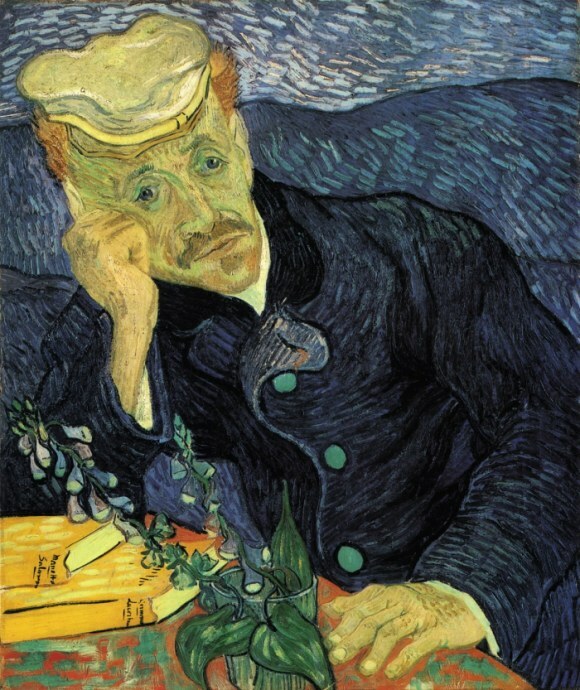 Some consider this to be a symbol for Gachet's profession or perhaps an indication that Van Gogh himself was being treated with digitalis while under Gachet's care. Note: This page is also available in Italian.